I never knew. I didn’t know about Regina Jonas. That is until this summer. Regina Jonas was the first woman rabbi. Ordained in Germany in 1935 she was a graduate of the famous Hochshule fuer die Wiesenschaft de Judentums. I had the privilege of traveling on a special study mission arranged by our teacher and colleague Rabbi Dr. Gary Zola in his capacity as a member of the United States Commission on America’s Heritage Abroad. This mission cosponsored by American Jewish Archives and the Jewish Women’s Archive brought together the first women rabbis ordained in each of the American denominations. We were joined by lay leaders of our Reform Movement, women colleagues and Jewish women scholars and some of our European women colleagues for a week of travel dedicated to re-discovering the life of Rabbiner Regina Jonas. I was so honored and deeply spiritually moved to be a part of this special trip. Traveling with our own Rabbi Sally Priesand, the first woman ordained by the Reform Movement, Rabbi Sandy Sasso, the first Reconstructionist woman rabbi, Rabbi Amy Eilberg, the first Conservative woman rabbi and Rabbah Sara Hurwitz the first woman ordained as part of the Open Orthodox movement and Rabbi Jackie Tabick the first woman ordained in England in 1975 by Leo Baeck College. 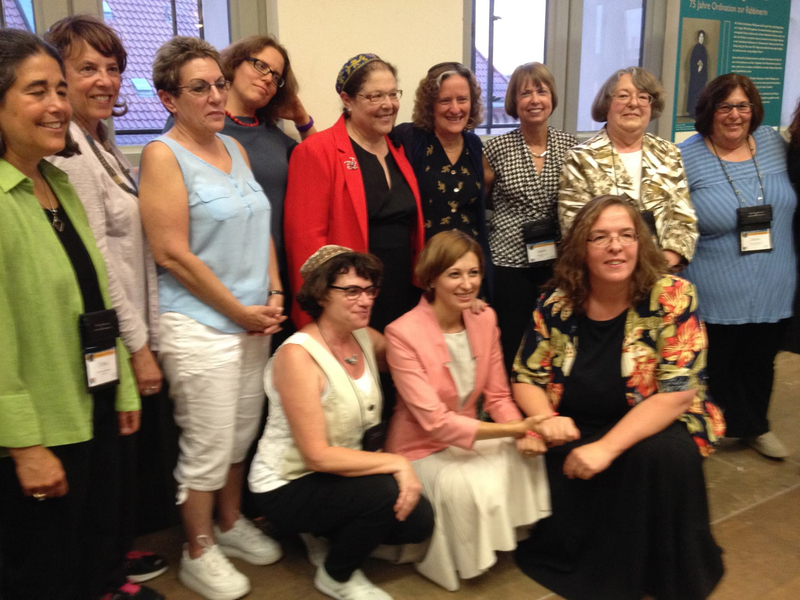 These pioneers brought their wisdom and experiences and together with colleagues, Rabbis Laura Geller, Dena Feingold, Lucy Dinner, Kineret Shiryon, and Alina Treiger (the first woman ordained in Germany since Jonas) and several others including Rabbi Gesa Eiderberg of Berlin and Rabbi Antje Yael Deuser of Bamberg. I learned of Rabbiner Jonas’ courage, light, and strength. While in Berlin, we saw what was left of her letters and notes, a small stack. We read her ordination letter written by Rabbi Max Dienemann who was the head of the Liberal Reform Rabbinical Association because she was denied ordination when her own teacher and in charge of ordination at the Hochschule, Eduard Baneth died and his successor Hanoch Albeck refused to ordain her. I was struck as we read the words conferring her smicha. She was an outstanding student, writing her thesis on “Can A Woman Be a Rabbi?”. But more than her academic credentials and her teaching abilities, she was described as “having the heart of a rabbi”. In those dark hours leading to the Shoah, Rabbiner Jonas taught and comforted the community. She led worship and visited hospitals and particularly cared for the elderly left behind as their children emigrated to Palestine, England or the US. She gave lectures until she and her mother were deported to Terezin in 1942. There she continued to serve the Jewish people. When we as a group visited Terezin to dedicate a plaque in her memory we saw a list of the classes and sermons she gave while imprisoned there. Classes that we all have taught: “Women in the Bible”, “Women in the Talmud”, “Shabbat and its Meaning”, “Observing Mitzvot”. She continued to bring hope and tried to use Judaism to sustain the faith of the people. According to records she worked closely with Vicktor Frankel while in Terezin. At the dedication ceremony in the Columbarium at Terezin Sally, Sandy, Amy and Sara read Regina’s words. Music was played by the child and grandchild of a survivor of Terezin brought us all to tears as we realized the generations lost and the generations who survived. Rabbi Eilberg chanted El Maleh Rachamim and again our group, her spiritual heirs, realized it might have been one of the first times anyone had done so for Regina Jonas. Chills enveloped me in that space of memorial. Rabbi Zola worked so hard to make this a moment of true memorial for Regina Jonas and helped each one of us pay tribute to this holy rabbi who served with such dignity. We went on to Prague as part of the mission. The second spiritual highlight of this mission took place in the Spanish Synagogue in the Old Jewish Ghetto. On Shabbat Morning, Sally and Amy led us in prayer. In this ornate and beautiful synagogue, which reminded all of us Plum Street Temple in Cincinnati, we prayed and studied together. Looking up into the second floor was the original pipe organ reminding me of the history of liberal Judaism in this part of the world. But most moving to me was the use of Mishkan T’filah in our worship. To me this was a true “l’dor vador” moment. Here we were the inheritors of Reform Judaism, born in Germany, returned despite the Shoah, despite the loss of so many, even as we rediscovered a true hero of our people, Rabbiner Regina Jonas, and we were using the siddur of our people in this holy space. We were helping to bring alive in a space that is hardly used at all for worship, a Reform Judaism of the 21st century. Sally led us in prayer and gave a beautiful sermon that touched each one of us. Again I had chills to realize how far we all have come. We stood on Regina’s shoulders and we still stand on Sally’s shoulders and the many women lay leaders who helped pave the way for all of us both men and women. I was so moved to be a part of this mission. I was deeply spiritually affected to honor our Jewish history this way and to ponder how each of us who as rabbis serve the Jewish people in some unique. Each of us whether through synagogue service, organizational work, chaplaincy, writing, or teaching contributes to the sustaining Jewish life. Rabbiner Regina Jonas did it in her way and we in ours. That is why we went to honor her life, to acknowledge her contributions, to make connections to our European colleagues, and to lift up Jewish life both in Europe and North America. A project I wish to suggest is that we as a Conference find a way to observe her yarzeit annually. Although we don’t know her exact date of death, she arrived in Aushwitz in October, 1944, she was another quiet heroine of our people. Perhaps we can simply observe Rosh Chodesh Cheshvan. In 1944 Rosh Chodesh Cheshvan was 5 days after she arrived at Aushwitz. Cheshvan is a bittersweet month of no holy days. And in the same way, although we mourn her death bitterly, we celebrate her historic life and the dedication as the first woman rabbi. May her memory live as a blessing. Rabbi Denise L. Eger is the founding rabbi of Congregation Kol Ami in West Hollywood, CA and president-elect of the Conference. Very nice! Well written and very touching. Beautiful! Can I post this on my Facebook page? I’ll give you credit of course! Thank you for sharing this important piece of history and your reactions and reflections. We take our Confirmation Class to Berlin as part of our yearly trip, where they learn a little about Rabbi Jonas. It will be nice to share this with them as well.